The bottled Starbucks frappuccinos are generally more convenient (and can be quite a bit more cost effective) than the blended drinks in Starbucks Cafes. For a long time, they have only been available in a few flavors, but some special editions were released for the holidays, including the Dark Chocolate Peppermint Mocha Frappuccino. The drink tastes like a liquid Junior Mint or York peppermint patty. 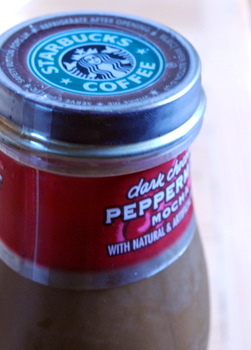 It has a great dark chocolate flavor, not too sweet but very rich because of the creaminess of the frappuccino. I prefer it to regular mocha (hopefully the dark chocolate alone will become a fixture in the lineup). The mint is just strong enough to cut through the chocolate without overwhelming it. It reminds me a bit of stirring a candy cane in hot chocolate and then licking the peppermint. It’s a great seasonal drink and fits the holidays well.